HP Spartacote introduced Sparta-Stain in March 2009. The semitransparent, dual-component stain is a polyaspartic system that also acts as a sealer. The base component contains the pigment and a polyaspartic compound. The other component is an isocyanate hardener. When the components are mixed equally, the staining product provides excellent penetration into properly prepared concrete, as well as the high level of adhesion and durability for which polyaspartics are known, Rowe says. Sparta-Stain is available in 12 translucent base colors. "We've always felt that we have a unique product in our polyaspartic system, and we're proud that we own the patent on the index for the formula," says HP Spartacote marketing director Ben Grier. "If there has been a downside, it has been that color and pattern options were, until now, somewhat limited. Before Sparta-Stain, decorative touches were achieved via color chips or sparkles. Now contractors can achieve an acid-stain, mottled or faux finish look, or even mosaics with a little taping off." Polyaspartics offer a number of benefits to the decorative concrete contractor: rapid cures (within 30 to 45 minutes), UV stability, and high abrasion and stain resistance. A polyaspartic topcoat can typically withstand vehicle traffic within 24 hours of application. The challenge was to create a stain that wouldn't diminish the existing properties that polyaspartics offer the decorative concrete contractor. "Sparta-Stain has the same strength and durability as our original polyaspartic floor system," Rowe says. "One of the challenges was to determine the right amount of solids in the base coat. We wanted vibrant colors, penetration into the concrete and the semitransparency that you see in most stains, yet we wanted to maintain the polyaspartic aspect of high stain and abrasion resistance and UV durability." David Schneider, owner of Global Garage Flooring & Design in Denver, recently added Sparta-Stain to his repertoire. It's easy to apply and sets up quickly, he says. "I've used it on jobs as big as large warehouses to as small as residential garage floors. The quality of the end product is second to none - excellent UV durability, it doesn't scratch or wear, and it doesn't delaminate." By rolling or spraying multiple layers of stain, Schneider can create an endless array of colors, he says. "The durability is the same as with the original product and the time-frame advantage - done in a day - offsets any difference in cost." Developing a polyaspartic polyurea semitransparent stain and sealer was a huge research and development challenge, says HP Spartacote president Sean Shiers. "We needed to ensure that contractors know they're getting the same quality that we've given them with the flooring products. 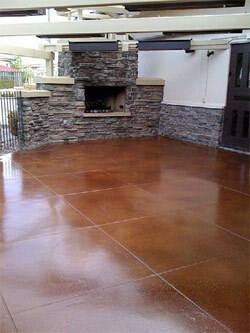 Contractors can either use the stain as a stand-alone system or seal the stained surface with our original sealer. Now the challenge lies in educating contractors in the plethora of options available. To meet this challenge, we've stepped up our training efforts and look forward to our live demonstration at this year's World of Concrete." From Shiers' point of view, the speed and ease of Sparta-Stain application coupled with the durability of a polyaspartic coating is the real achievement. "When you consider that applying other stains is a multiday, high man-hour proposition, and add to that the durability and longevity of our patented polyaspartic coatings, we think we're offering contractors a great alternative."